Analog Switch OM 2two-channel analog switch one change over per channel electrical insulation between drive, "contact" and auxiliary energyThe analog switch module OM2 has been developed for applications in which the quality of relays is no more sufficient to switch set values or measured values. 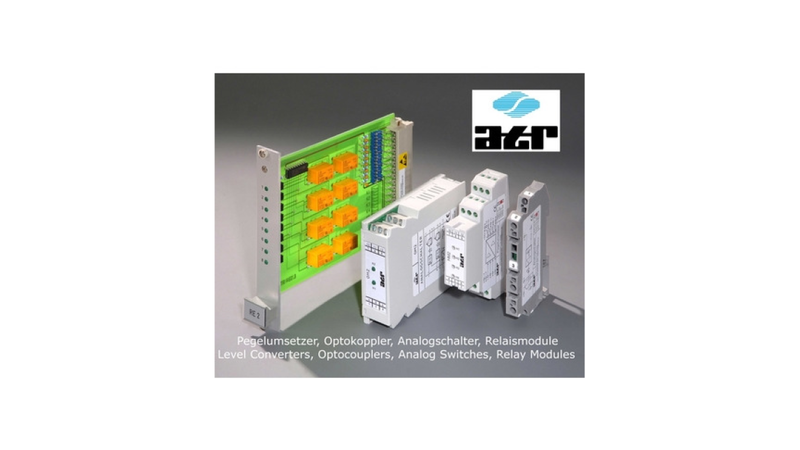 Analog switches offer many advantages compared to relays:no wearno contact bouncevery short switch timesinvariable contact resistance, even in the case ofvery small signals and few duty cyclesThe devices are constructed in two-channel design with one changer each. Drive and "contact" are executed separately for each channel. The switch condition is indi-cated by LEDs in the front panel. All "contact connections" are provided with a protective circuit to protect the analog switch from being destroyed by voltage peaks.The devices are available for 5V and 24V control voltage. The drive of the analog switches is made by optocou-plers. Power supply is by an internal potential-separating DC-DC converter, thus ensuring electrical insulation be-tween drive, auxiliary energy and "contact".The devices require an auxiliary energy of 24Vdc and can be easily snap-mounted onto mounting rails TS35.